Let’s take the case „Software development“ as an example to explain “Devops”. So, if a company wants to achieve maximum amount of quality of his product (the developed software in this case), they need to walk this way and establish these phases. But, like I already mentioned in that post: (http://www.svenheide.de/2016/04/16/agile-product-development/) Quality is expensive! And today the customers are simply not willing to pay this higher price for quality anymore… Everything has to be cheaper! Additionally “Devops” addresses a new way of cooperation between the team who develops (Development team) the application and the team who actually releases or runs the application on the future production environment (Operations team). 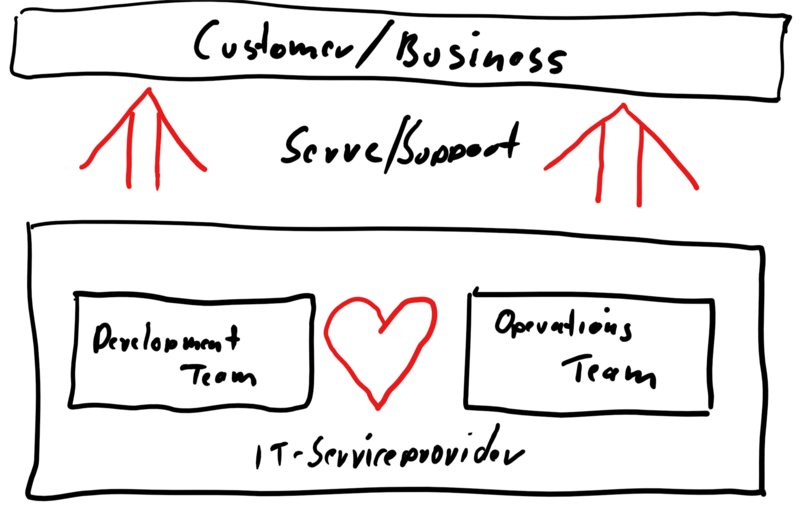 So “Devops” also requires a new way of thinking of different teams or departments IT-Service providers, many IT-Service providers experienced these “internal fights” between the their software developers and their people who actually run the production environment (the employees who are actually responsible for rolling out the new software releases and run it high available and with the highest amount of quality as possible). Serving the Business, so that…the “Business” gets enabled to achieve their Goals!